According to ChemOrbis, African players have started to voice their expectations of improved market conditions following the steep price decreases that were implemented in February. These expectations have led to some cautious restocking on low stock levels ahead of expected improvements due to the season. Overall demand in Africa is still not that bright, but players’ current reports definitely indicate an improvement when compared to previous weeks. These better expectancies, and the recently improved demand, are stemming from the approaching high season for some PP and PE applications and also from players’ low stock levels given their very limited purchase amounts after a long period of decreasing prices. In Nigeria, the local currency continued to record further losses against the American dollar and the government’s decision to postpone elections to March 28 from February 14 worsened the situation. However, just prior to the postponement, some players had already started to stock up cautiously as they wanted to avoid potential currency fluctuations that could occur due to the elections. A Tanzanian converter also highlighted the approaching high season for some raffia products and added that players can no longer postpone their purchases. “We are currently meeting our needs but we are also aware of the fact that as of next month, March, we will need to start stocking some cargoes,” he commented. In Kenya, a buyer reported making some fresh purchases during this past week after the Middle Eastern producers adjusted down their initial February levels. “Although the buying interest remains limited to the buyers’ needs amidst comfortable supplies; we are not expecting any further decreases for the upcoming term given the already hefty cuts issued by the producers. As of late February, prices might start seeing some stabilization,” he further added. Another Kenyan converter also voiced their rollover expectations for March. “If prices are not rolled over, then we anticipate only slight decreases,” he cited. Tunisian buyers however, have started to pronounce that there might not be major drops in March while Moroccan players reported that some Middle Eastern producers withdrew their February offers from the market after announcing them with decreases, claiming limited availability. Players in that country tie such moves to the producers’ increase expectations for the upcoming month. In Egypt, players have also started to forecast that the price trend may become firm, or, if there are price decreases, they will be only minor ones. They highlight the limited supplies, especially for some PE products, and firmer sentiment in the energy markets. 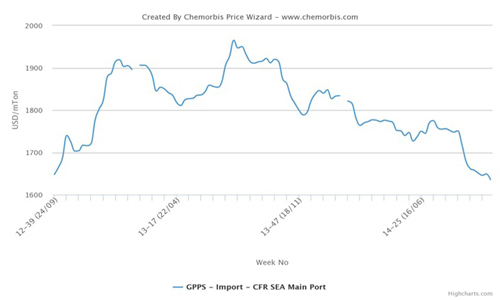 In South Africa, a converter, who received February PP and PE prices with up to three digit decreases, also noted that overall demand has started to give signs of recovery while adding that they feel optimistic for March, according to ChemOrbis.